The Institute for Diversity and Empowerment at Annenberg (IDEA) at USC Annenberg released a report entitled Inclusion or Invisibility? 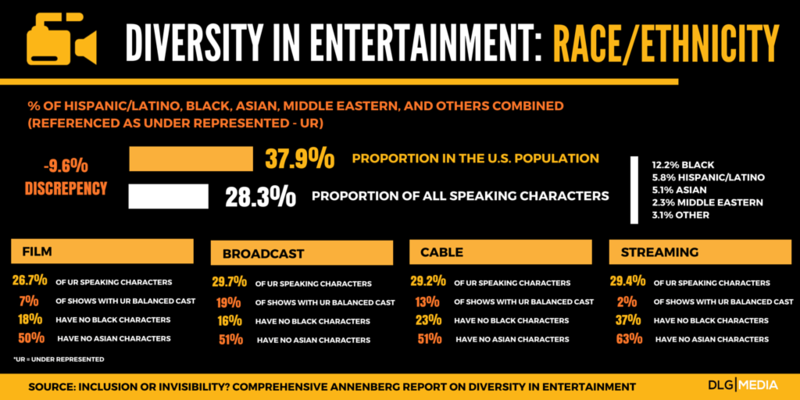 Comprehensive Annenberg Report on Diversity in Entertainment detailing just how much lack of diversity in media exists today. The report was written by students and scholars of the Media, Diversity, & Social Change Initiative (MDSC) at USC’s Annenberg School for Communication and Journalism. 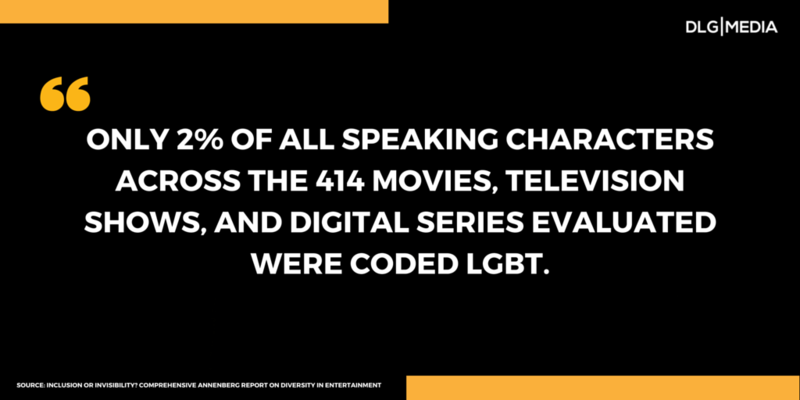 The report looks at inclusion in entertainment and ranks companies based on how inclusive they are both on screen AND behind the camera. The report looks not only at racial and ethnic diversity; it also looks at gender, sexual orientation and even diversity in the board room (confirming what we already know: Board of Directors, C-Suite execs and managements teams are overwhelmingly male–80% versus 20% female). The report goes in deeply, for example, analyzing sexualization of characters by gender and by ethnicity. (The report found that Latinas are the most sexualized characters onscreen). Most stories fail to reflect or match the demographic composition of the U.S.
African-American, Hispanic/Latino, Asian, Middle Eastern represent 28.5 percent of all speaking characters on screen, despite being 37.9 percent of the US population. (almost 10 percent discrepancy). 71.7 percent of people on screen are White. At least half or more of all cinematic, television, or streaming stores fail to portray one speaking or named Asian or Asian American on screen. When film distributors were tested on inclusivity, all media companies (21st Century Fox, NBC Universal, Sony, The Walt Disney Company, Time Warner and Viacom) scored a failing score for inclusivity (under 25 percent). Television and digital distributors who earned high marks for inclusivity: The CW, The Walt Disney Company (70 percent) followed by Amazon and Hulu (at 65 percent). Least exclusive: Time Warner (15 percent) and 21st Century Fox, CBS/Showtime (20 percent). A report like this (the first of its kind) is disheartening on so many levels yet comes at a much needed time when underrepresentation of racial and ethnic groups in all aspects of society in the USA are being highlighted and brought to the forefront, thanks in part, to the public expressing their concern on social media and to voices like Viola Davis (who explained that what is lacking for women of color is opportunity), Gina Rodriguez (who made a wonderful speech when winning the Emmy for her role as Jane the Virgin about being part of a culture that wants to see themselves as heroes) and Will Smith (who has been outspoken on the lack of diversity in the Oscars this year). MDSC recognizes that shifting from invisibility to inclusion is not an easy task—but offers their assistance to companies who wish to develop and implement concrete solutions and help monitor progress. The whole report is definitely worth reading! I agree! This is the sad truth but the only time we see diversity in a negative connotation of people via violence, death and crimes. I wish we have more positive images of diverse individuals and have more people of color in media. I worked on a PSA for an organization and researched the lack of latino/as in the media. Time to speak up. Great work on relating it to the oscars and hollywood. Love all the facts. Facts don't lie :) Thank you for sharing.